Kombucha Scoby is a colony consisted from bacteria, yeast and cellulosic pellicle that present fantastic performances in various fields. Besides anti-toxicity and antimicrobial specifications of Kombucha scoby, this unique colony can be used for waste water treatment and removal of heavy metals. 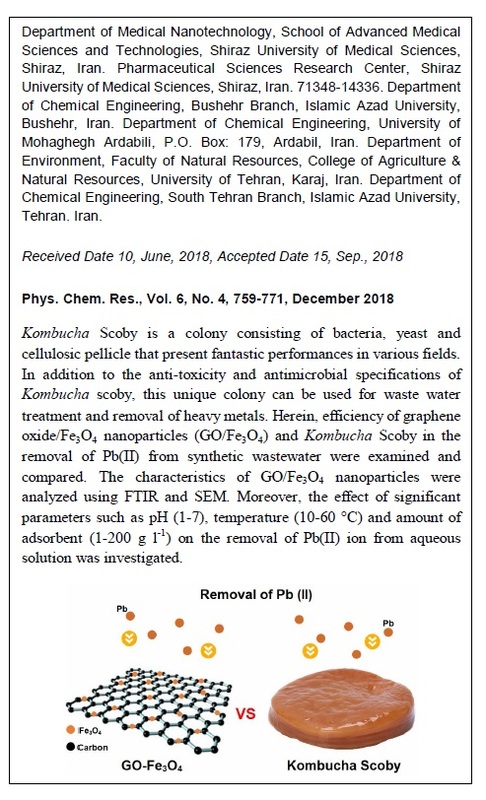 Herein, efficiency of graphene oxide/Fe3O4 nanoparticles (GO/Fe3O4) and Kombucha Scoby in the removal of Pb (II) from synthetic wastewater were examined and compared. The characteristics of GO/Fe3O4 nanoparticles were analyzed using FTIR and SEM. 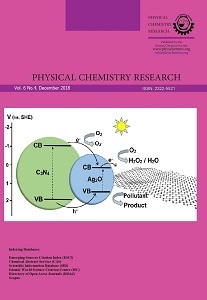 Moreover, the effect of significant parameters such as pH (1-7), temperature (10-60 oC) and amount of adsorbent (1-200 g/L) on the removal of Pb (II) ion from aqueous solution was investigated. Obtained results showed that the maximum adsorption efficiency was obtained at a temperature of 50 oC and adsorbent amount of 0.3 and 15 g using GO/Fe3O4 and Kombucha Scoby, respectively. Additionally, pHPZC values of 6.1 and 6.2 were obtained for GO/Fe3O4 and Kombucha Scoby, respectively. The maximum adsorption efficiency for GO/Fe3O4 and Kombucha Scoby were found to be 98.08 and 99.73 %, respectively. Likewise, the adsorption isotherm behavior of Pb (II) on adsorbents were investigated using Langmuir and Freundlich models. Achieved results showed that the Langmuir isotherm model was better fitted with experimental data. Furthermore, the maximum adsorption capacity by Langmuir model for GO/Fe3O4 nanoparticles and Kombucha Scoby were found to be about 114.9 and 126.6 mg/g, respectively. Generally, achieved results revealed that Kombucha Scoby, which is a cost affordable colony, can remove Pb (II) ions from water better than GO/Fe3O4.